A lot about "the forehand stroke" has to do with traditional footwork, body usage, and weight distribution methods that preceding Steps outlined as counterproductive to efficiency and results. Instead, by moving naturally, moving into the ball, shifting your weight into the contact spot and eliminating body rotation, your forehand will feel and play better no matter what your stroke looks like. But something is missing from all the tennis literature on the subject. That something is the natural use of the arm's leveraging ability during the forward swing. That something maximizes the stroke's acceleration. That something I call The Neat Stuff. I'm going to assume you already know about "how" to hit a forehand, that is you're familiar with the grips, Bollettieri's "Killer" forehand, Tennis magazine's breakdown of various pros' forehands, and various other ideas proffered by old and young alike. To refresh, you have the loop backswing and take the elbow back. The open stance. The great winding, or loading, of the shoulders and hips. The great unwinding of same allegedly for power and stroke acceleration. The weight transfer toward the opponent. The major wrap around the neck for the follow through. Finishing with hips and shoulders facing the net or with either the back shoulder or the back leg or both out forward into the court more than their counterpart. And it's been like this since day 1 for tennis, some hundreds of years ago. I believe Bill Tilden's forehand is no different in its structural use of the arm than Andre Agassi's, only that Andre does everything a lot faster. After all, Mark McGwire's use of his arms on his swing isn't different than Babe Ruth's, and Tiger Woods' use of his anatomy is not any different than Ben Hogan's. Today's athletes, it can be argued, simply do things a little faster and for more duration, but the structural use of the body, specifically the use of the arm, doesn't change because it can't. If it did, we'd either have tons of injuries or we'd be witnessing a new evolutionary stage in human development. Baseball pitchers have tweaked their delivery a bit to help reduce rotator cuff injuries, but for the most part the throwing motion remains the same. Earlier Steps placed you moving forward into the ball in an attempt to hit the ball off the front foot with good body balance and little, if any, rotary movement from the body to accelerate the stroke. Revolutionary Tennis advocates that by using your body's linear momentum as your power source instead of angular momentum your tennis racket can accelerate best in terms of speed and contact value. If you don't accelerate the racket into the ball, "power" isn't realized, no matter how good your movement, structure, and weight shift; if the acceleration isn't controlled, accuracy is lost. And if you're an advanced player your torso turns a little bit more than your lower body when preparing the stroke and moving into the ball, and then re-turns to match it during the forward swing and into contact. At the end of your routine your objective is not to face the net with either hips or shoulders - if you do ‘cause you swung so dang hard that's one thing, but if you incorporate that as part of your swing you're overdoing things and will lose control. Many in the tennis teaching community conclude the arm remains in that same crooked position during the execution of the forward swing. This is known as keeping the arm in a fixed position, or swinging the arm into the ball. Photo 8A illustrates this concept, the arm remains in a crooked position between backswing and contact. In other words, the elbow remains behind the hand and forearm throughout the forward swing. Well, there's a whole heck of a lot going on between the backswing and the contact spot. The arm doesn't remain in a fixed position, it can't. Blink, and the world passes you by, it's been said. Same here. Much has been made about this elbow business on the backswing because of all the pictures where the pro's elbow is drawn back looking like s/he's elbowing somebody standing behind them in the eye. There exists the same image in a baseball player the moment he takes the ball out of his glove, his elbow points back behind him. But in baseball you don't keep a fixed arm and shove the ball to "throw" it from that crooked position, and neither should you in tennis. An arm needs to be flexible if you want to throw a ball or swing an object fast, and keeping the arm in a crooked position denies this. Forehands are somewhat similar to throwing sidearm, though I emphasize "somewhat" inasmuch both offer a lateral movement around the body, and that throwing sidearm accurately is very difficult to do. The action involved in a backswing involves taking the racket face back, not the arm. And there are plenty of pro photos showing the elbow not pointing backwards but down. The arm goes along for the ride, yes, but the racket face is getting ready to hit the ball, and the arm is getting ready to act like a spring. That the elbow goes back is like the orchestra warming up. Looking at a photo with a pro's elbow back on the backswing doesn't mean "take the elbow back" any more than a photo of a baseball pitcher with a straight arm after release means "straighten the arm to throw a ball." This elbow business is much ado about nothing. It has been written that your arm is supposed to simulate "a pendulum motion" during the forehand swing, as in you extend your arm as a unit downward and then swing up. That's okay if you're bowling, but in tennis the ball's up in the air and moving by you, and the arm has to quickly swing the racket and configure itself to absorb the ball's impact against it. For quickness, adjustability, and strength, the arm (forearm) bends at the elbow and both racket and forearm travel laterally around your body. More on the pendulum motion follows in Part II at the end of this section. To illustrate how your arm flexes laterally around you, tuck your forehand elbow against your side and hold out your forearm away from your body at waist level and your hand straight up and down. Your arm is now bent at the elbow. If a clock face were beneath your forearm and hand, your forearm and hand would be pointing at 12 o'clock. Keep the elbow still and swing your forearm and hand to your left (for righties) toward 9 o'clock. This part's easy, and feels very natural. Hold this position. Keep the elbow still and swing your forearm and hand back from 9 past 12 to, say, 2 o'clock, if you can, or only 1 o'clock. When you swing back toward 2 o'clock your forearm and hand move past your stationary elbow and biceps (and the biceps flexes to hold its position). Relax the tension you feel and allow the hand to return to 12 o'clock, noticing the spring action. 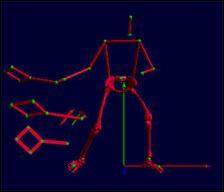 This is the first part in understanding how the arm flexes laterally around you. A powerful forehand uses the arm in much the same way an overhand throw does. Again, apply what you already know to your tennis game. A weak throwing motion keeps the arm and wrist rigid, or fixed, and lacks pronation (more on that follows later); an inconsistent throwing motion finds the arm and wrist flimsy like a pancake, or rubbery. The big not-so-secret secret from throwing overhand lies in the relationship of the forearm to the biceps. Say you're holding a baseball and you want to throw it. You hold the ball up by your ear, turn your shoulders, and your elbow is "back." Your arm is in a crooked position. To throw the ball the elbow drops and comes forward, your hand with the ball lays back and the biceps moves forward ahead of the hand and forearm. As in the example above using the clock face to swing your hand and forearm over to the 2 o'clock position, the forearm first swings back behind the elbow and biceps that are going forward. Then, like a spring, the forearm reverses this direction to complete the throwing motion, catapulting forward past the elbow and biceps. This motion is no different for tennis. Let me explain. Photo sequence 8B below illustrates how to do this, it illustrates the missing pieces in all photographic analyses of tennis forehands. Photo 8B1 starts the sequence with the arm in a crooked position for your backswing, what you always see by itself. 8B2 drops the elbow down toward the court below you, as in the throwing motion, freeing the forearm to take the racket fully back behind you, and it lays the wrist back. Again, you're used to seeing this single photo by itself (Stan and Steffi above). Now for the missing link. The elbow slides forward and gets in front of the hip (actually in between photos 8B3 and 8B4 but shown in 8C3 below). This leaves the biceps not straight up and down but angled forward, 8C3. The elbow and biceps stop their movement, 8B4 - 8B5, to allow the forearm and hand to catapult the the strings into the ball. The 8B sequence uses the arm in the same way an overhand throwing motion does. The elbow drops and comes forward first, allowing the forearm to swing back behind it and the biceps, which then allows the forearm to re-spring forward past them both. This is the key ingredient in all top forehands, and what's missing in everyone else's. The teaching term "keep the elbow in" is often the reason this key ingredient is lacking in so many forehands, it keeps the elbow just behind the body or to the outside of the back hip instead of allowing the elbow to slide forward. This term is accurate, the elbow is "in" close to the body, but the elbow is also fluid, it shouldn't remain behind the body because it'll keep the arm crooked throughout the forward swing as in 8A above. Photo 8C better shows how the elbow drops, slides forward, gets in front, or ahead, of the back hip, then stops to help accelerate the forearm, hand, and racket forward. Illustration 8D mimics 8C in stick form. The upper arrow in the first frame shows the forearm will be arching back, the lower arrow shows the elbow will lower. The curved arrow in the second frame shows the (slight) rotation of the back shoulder to help boost and support the arm's intended acceleration (of the racket), the bottom arrow that the elbow will slide forward. The curved arrow in the third frame shows the hand and forearm "throwing" laterally around the body while the elbow remains still. This third frame represents the crowning achievement in racket acceleration. Photo sequence 8E tries, in its own simple way, to help you see this crowning achievement in racket acceleration. The racket itself travels the most distance in space, and, in decreasing increments, the hand, the forearm, the elbow, the biceps, the shoulder. The hand/forearm travel far more distance than the elbow and biceps here. Let me shows you some pros in action to better see this really neat stuff. Step 4 explained the adverse impact body rotation has on a tennis swing, and that little rotary movement is necessary from the back shoulder to get the swing going or even to boost it. And if a little less than that comes from the hips, its controllable, at least. Sadly, though, the idea that if a little bit is good, a lot must be better. Not. If the shoulders and hips rotate unabated, is there more power? Maybe in the world of sports scientists, who calculate that more "power" results when you rotate the greatest number of body parts and swing in arcs far away from the body. But how far do golfers rotate, or baseball players? Is their objective to face their playing field at contact? If baseball players felt they'd get more power by facing the pitcher at contact like a tennis pro facing the net, don't you think they would? But they don't, and neither should tennis players. Step 6 showed how the acceleration of an arc (stroke) is greatest when the common point to the arc remains still. In tennis, this is achieved in one of two ways. Either the common point (the back shoulder on forehands) remains pretty still after a certain point, or the front shoulder acts as a brake against it to prevent it from moving too much (common on serves). When the common point moves around unabated, this acceleration principle is lost. Today, a lot of rotary movement is sought on the forward swing. Too much. Not only does contact accuracy and quality suffer (because the ball is angling away from the direction of the rotary movement), but racket acceleration suffers as well. At the very least players with open stances and extreme grips should strive not to throw both shoulders around during the swing, they should strive at least to control the front shoulder and hand. The following photos explain. This is the entire sequence to the NBTA's killer forehand. It's clearly seen the emphasis is on "if a little is good, more must be better" idea to rotation. The rotation is exaggerated because the student's standing still prior to contact instead of moving somehow into the ball, even with the back foot. The web site's instruction for this open stance is to "keep your weight on the outside foot until after contact," which I don't see happening here. As a result of exaggerated rotation, the follow through idea becomes similarly exaggerated. All right, I give in. You want to rotate you say? Let me show you how to and how not to. If you're one of today's players, you're standing in an open or semi open stance prior to hitting a the ball. You're not going to step into it with the front foot, you're going to rotate your body in the direction of your shot, which is toward the net like the NBTA killer forehand above or the girl in the open stance. Or you're going to rotate so that you bring your back leg (and hip) around towards the net just as you'll bring your back shoulder around to the net. If you're going to rotate, rotate INTO THE BALL as shown in the photo above next to the girl and not toward the net. If you're going to bring your back leg around, bring it INTO THE BALL, not toward the net. If you move yourself toward the net, you're shifting your weight away from the ball because it's moving away from you. Rotation in and of itself does not accelerate the racket. Rotation acts more as an initial combustion agent, or first phase, to racket acceleration. I've mentioned earlier about the slight re-turning of the shoulders to initiate the forward swing for advanced players and those who want to be. The same applies to "rotating" the lower body if and when you find yourself either in a sideways position or open position. In both cases the solution is a little goes a long way. Obviously if you're sideways you can rotate more than when you're open, but then you always lose control when doing more. Power is just awesome when you rotate (though inconsistent by definition) out into the direction of the contact to encompass the ball and time the hit just right. And then it's tempting to rotate more to get more. More for more's sake doesn't exist, in so many different variations. The final point is you actually need to do less rotation to accelerate your racket more. It's not ironic, it's predictable. The primary responsibility to rotation is to empower the contact spot. Secondarily, rotation acts as a boosting agent for racket acceleration. If you overdo this boosting part its friction slows down the racket. Ultimately it is the arm that needs to work efficiently within itself for acceleration to be realized, and I hope I outlined that clearly enough above when describing how the arm works to swing laterally around the body. This is the reason why you see players with great forehands so "open" facing the net after the hit. It has been the acceleration of the stroke (arm) itself that has pulled the body around like this and not the other way around. It's not about the body turning (rotating) around "and pulling the racket arm along," which is often stated. A follow through is verification of the type of shot made, and what follow throughs look like vary with the amount of time you had to swing forward, the amount of court you had in which to hit your shot, the amount of time you want your shot to take to reach your opponent, and the oomph you gave it. As such, the endpoints of follow throughs vary, but there are three points to which all follow throughs should adhere. These three points are themselves flexible, as you'll see. The idea there's a certain height or length to all follow throughs ignores the simple facts the ball is ever-changing in speeds and heights against you, and you're placement on the court, hitting power, ball placement and depth are ever-changing as well. First, the racket face finishes above the hand (in height above the court surface, 8B6 above), and not finish below it per the photo on the right of the NBTA student. I've drawn two white lines to better see his racket face, which is well below his right hand. The racket edge does not need to point up directly to the sky, or stop at a predesignated height. That's exaggeration, and is reserved for little tykes needing to develop hand and wrist strength to control the swing, nothing more. When little tykes get used to it they immediately start learning adult technique. The next two things go hand in hand. The harder you hit the ball, the better you become, the more the ball goes out. You adjust, either consciously or subconsciously, but the same two things occur besides changing your grip. Your follow through no longer stops (with the arm) extended out away from you body directly toward the net, the arm and racket start to come back to your body AND the racket faces down. Not completely down as if looking, or facing straight down to the court by your feet, simply the racket face no longer finishes on a knife's edge, it tilts to your opposite side. And the arm bends back into your body, or recoils. Keeping your arm extended out away from you is entirely arbitrary and forced. No one throws a ball like that. It's both natural for the arm to recoil, and for tennis players this move withdraws power because the playing surface is so small. In baseball and golf, with their large fields, you hit the ball and e-x-tend while doing it. If you extended similarly for tennis, you'd hit it over the fence. More on this follows last in Part II at the end of this section. The elbow and arm are kept in front of the body, and the height of the hand varies. The popular idea to follow through to your opposite ear to hear the ticking of your wristwatch on your forehand wrist compromises the contact value of what is an ever-changing ball in an every-changing situation. Spin is simply a matter of the strings brushing against the ball. Without a brushing effect upward, downward, inward, or outward, what you'd get is a ball hit with no spin. For topspin the racket face is vertical against the ball at contact, that is straight up and down, and it brushes up because you're swinging low to high. But there exists great controversy in the teaching community regarding the delivery method to place the racket face vertically against the ball at contact. The controversy centers around the use, or non-use, of the wrist. Is the wrist in a fixed position for both backswing and forward swing, or does it move? Does the rollover action contribute to topspin, is pronation involved? The status quo always cops out by saying pro A hits the ball a ton because he does use his wrist/rolls over/pronates but that you shouldn't. One well published guy even says to keep the arm and wrist fixed throughout backswing and forward swing to "minimize every possible chance for error." Condescending, isn't it. Some of these status quo guys never had a heavy, world class forehand. Some former top tenners didn't either, though you'll see them in popular tennis literature showing you how to hit a forehand. But when greats like Pancho Gonzalez, Rod Laver, Pancho Segura, and Bill Tilden all talk about using the wrist, I think those who call themselves tennis sports scientists should try to figure out what they're doing with the wrist instead of disproving what they're saying. That's right, the popular tennis sports scientists of today, not a world class tennis player among them, actually try to "prove" that what tennis greats and Grand Slam winners like Gonzalez and Laver are saying about their wrist movement is wrong. Imagine that. And to those few well meaning sports scientists who say top athletes can't articulate what they're doing, if you ask the right questions, and listen to the answers, you'd be pleasantly surprised. The tennis establishment says pronation isn't responsible for creating topspin. The establishment opines that topspin is created solely by a vertical racket face brushing low to high, and that to best achieve this the arm and wrist will remain fixed during the swing. The following is photo evidence used to support this belief. I'll include the accompanying quotation and you can figure out what's being said, not said, and what's being inferred. The establishment then uses this "proof" to structure a unique topspin schema, shown in the next photo. Here the racket impacts the ball vertically, and the hand and forearm, which remain fixed throughout, will not roll over even after impact. Curious, though, how the racket is more than vertical at impact, it's rolling over, and then rights itself later? According to the establishment's sport scientists who undoubtedly influenced an entire generation of players and teachers, pronation is not absolutely necessary to create topspin. That is, a vertical racket face creates topspin. While literally true, it is shortsighted. Let's talk karate punch for a second. If you were to take a stop action photo of a karate punch the moment it struck a wooden board held out in front of the student, the fist would be flush, or square, against the board. The knuckles go left to right, the palm is down. Does this mean the hand was so placed from the beginning when the student threw the punch? No. The karate student starts with his fist palm up, held by his side, and then corkscrews his arm (pronates) to deliver his punch with the palm facing down at contact. The same happens when you throw a baseball. 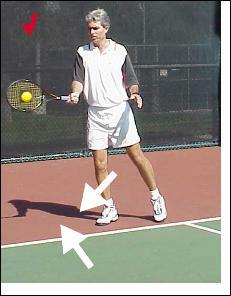 The same is acknowledged to happen on a tennis serve, that is pronation. Well, pronation is how the arm delivers itself for strength. And it holds for all forehands, except slices. The tennis establishment has said that pronation is not mandatory on a forehand to produce topspin unless "a person were hitting with a racket face pointed upwards and was forced to roll the forearm in order to properly position the racket [vertically] against the ball." This was included in an email sent to me January 29, 2001. As seen earlier, pointing the hand upwards is the direction for supination, that is rotating the hand in the clockwise direction. The tennis establishment is saying pronation is not mandatory to produce topspin unless supination occurs first. This in fact happens. The following sequence from Steffi Graf shows her racket face first pointing upwards during the forward swing before she corrects (rolls) it to place the racket face vertically against the ball. 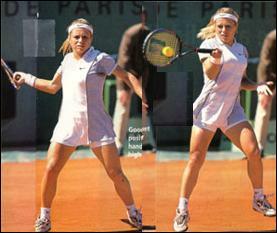 The angle of her racket face in Frame 1 is perpendicular to the court below, using a north south axis, or top to bottom. In Frame 2 this angle has changed, the racket face is leaning back, or open, or pointing upwards slightly. The hand has supinated, it rotated the palm upward. Frame 3 returns the racket face perpendicular, closing it prior to contact. What does this mean? It means the hand reversed its direction to place the racket face vertically against the ball, it means the hand pronated. The signature proof of this shows up in the contact shot and follow through. The contact photo is missing from this publication, I couldn't track it down. Frame 4 is post contact, and the racket face, predictably, has opened a bit, but it's nowhere near the very open angle of Frame 2, it is still being held in the "vertical" position. Frames 5 and 6 find the racket face more than perpendicular, confirming what the hand was doing between Frames 2 and 3. More follows. What about the players who keep their racket facing down on their backswing? They, too, wind up rotating the palm upward to place the racket properly against the ball. No, not pointing upward, just rotating the hand in that direction (as opposed to down). Consider: Tommy Haas above has his racket very closed in frame 1, more than perpendicular, and in frame 2 it is perpendicular. Hence, logically, it must have opened. 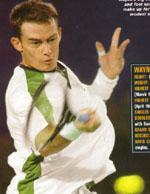 In Tennis magazine's march 2001 issue, there was a look into tennis' future. In a sidebar was a stick figure of a top pro hitting a forehand, and I include here the representation from the company's own website (identified below) because it's clearer than scanning the magazine's image. Notice the angle of the racket face in the first frame, it faces down somewhat, denoted by the narrow looking racket face. In the second frame the racket face isn't as narrow anymore because it has opened. The third frame finds the face close to perpendicular. The racket hand supinates, or rotates upward/forward, in this sequence to place the racket vertically against the ball. For close readers, notice how the green dot representing the elbow in the middle frame moves to get in front of the back hip, as shown in 8C above. Very interesting, isn't it. And if you really don't see it, this additional frame showing what each racket angle would look like in the backswing if the angle did not change at all during the forward swing may clarify it. The top racket belongs to the first frame, the racket is back and faces down somewhat. The middle racket belongs to the second frame, and I matched the tilt to the first racket. The bottom racket I drew and corresponds to the contact angle in the third frame above, close to perpendicular, and I did my best to be honest with it. It's supposed to angle toward the viewer a bit. Examining the racket face's angle from top to bottom, the racket face opened in order to place the racket face perpendicular against the ball for topspin. The hand supinates, or opens up, during the forward swing. It doesn't point upwards to the sky, but it's in the process of rotating upward from its downward facing position. Now, let me ask you, is the racket open at contact? No, it's vertical. Why doesn't the racket face open up at contact if the hand opens to begin with when placing the racket vertically against the ball? Because the hand stops that movement prior to contact. Is the racket face open then after contact? No, it rolls over. Why? Because at contact the hand is going in that direction, that roll-over direction. And that direction is called pronation. Or look at it this way. Which is easier. Will the supinating hand stop its upward rotation on a dime and at just the right angle and stay fixed that way when the ball tweaks the racket face, or will the hand reverse itself to counter both the upward momentum from supination and counter the tweaking of the racket face at contact (pronation)? Hey, just look at the follow through, that roll-over thingie. Why is this so hard for the tennis establishment to grasp? Beats me. The answer then is clear. Pronation "properly positions the racket against the ball" because the racket "has been pointing upwards first," using the establishment's own criteria for accepting the idea. Please notify any tennis establishment members you know of (easily found in the magazines and on the shelves), and tell your own local pro about this argument. You'll be helping yourself and all those young kids behind you. In addition, please contact the good guys at TennisWeek, The Tennis Channel, and Inside Tennis to enlist their help and put an end to the medieval belief that pronation is not a part of a tennis forehand groundstroke. The good people of Bio-Kinetics Inc., of Salt Lake, Utah, are responsible for the stick sequence above, and Mr. Paul Reddick took the time to inform me that, in their view, the racket opens "because the hips turn to strike the ball," and that the racket face closed into the ball because of the symbiotic relationship of the two elbows. I argued it was because the hand pronated, and the response I got was that pronation is a non-teach thing. Bio-Kinetics, Inc. is heavily into baseball and offer that some things are non-teachable things, such as pronation, as in when throwing a ball. I proposed that while in baseball pronation may be a non-teach thing, in tennis pronation on a forehand and serve is a must-teach thing, and we found common ground. I'm glad I found them, and I thank Tennis magazine's editors for that. One last word. The establishment responds that the roll over obviously seen after contact is about releasing the forces of the musculature, and they further state that Andre Agassi "went nearly eighteen inches past the impact point before his wrist made a single degree of displacement [that is pronation]," and that there was no displacement before contact as well. And in the late 19th century we used to think a galloping horse always had one hoof touching the ground at all times. 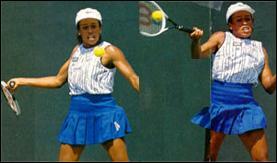 The next photo is of Monica Seles, and it clearly shows the angle of her racket to be more than vertical on the ball. Underspin for groundstrokes is known as slice, and its execution is commonly understood. The racket face is beveled, and you hit under the ball. Of course you don't literally hit the point farthest beneath the ball, you'd send it straight up like a geyser. The image is that you hit in the direction under the ball as opposed to in the direction over the ball. Topspin is also known as overspin because the racket strikes the ball by going in the direction over the ball. It doesn't strike the ball literally on the top, that would send the ball down to your foot, but the image is that the racket moves from low to high brushing the ball upward and in the direction over the ball. 8F shows the image of how the racket goes "over" the ball for topspin, regardless if it's rising or falling. Enough said. I hope this has been of some use. As mentioned from the very beginning in Revolutionary Tennis, what helps your stroke the most is improving the use, response, and structure of your body toward a ball angling away from you, as well as simplifying where to place the ball. Strokes don't exist in and of themselves, they are dependent on the body, on its locomotion, balance, structure, sensory input. Strokes require their own self discipline, and stroking requires body self discipline. Not every ball can he hit large, not every deal is a gangbuster. But you must improve the use of your arm to improve your forehand. In this montage of shooting a basketball it appears there is little if any wrist movement at the release point, similar to Vic Braden's idea that on a forehand topspin "there is not a single degree of wrist snap at the impact point." Even though we know the wrist snaps when shooting a basketball, evidenced by the characteristic flop-over after the shot is made, this basketball montage could be used to argue the opposite, that is the basketball player's wrist remains locked or fixed throughout the upward delivery. It can then be revealed the "secret" to shooting is the moving or straightening of the arm as a lever like a catapult and that the wrist snap seen after the release has nothing to do with the shot but has to do with the release of natural forces. Then it becomes a "myth" to snap the wrist when shooting a basketball. It's okay to laugh, but this is what happens to us in the tennis world regarding a topspin forehand groundstroke. Using the word "snap" for a tennis forehand's wrist movement is exaggerated, but it does work on a basketball shot even though you don't see it happening until after it's happened.. 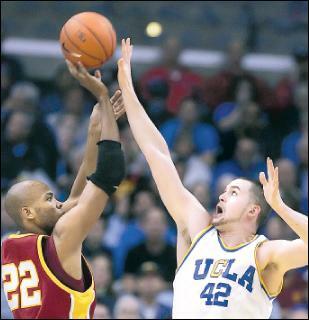 The photo on the right of the USC player shooting clearly shows the ball out of his hand with his hand/wrist still extended, or in the laid-back position. A tennis "scientist" would use this photo to opine there is no wrist snap, or forward flexion, to a basketball shot because there is no flexion seen at the release point, or impact point. Agassi says he uses "a lot of wrist" in his shots, but Vic Braden, et. al., look at high speed video of Agassi's forehand and proclaim Andre is not using his wrist because wrist displacement (deviation/flexion) is not seen at the impact point but is seen only "long after" contact is made. Many tennis people believe Vic has proven Andre wrong, perpetuating this narrow mindedness. High speed video is good for observing broad issues but it is not discriminating enough to discern something as small and as quick as wrist usage, even at 40,000 frames per second. Only when the hand and wrist are wired for feedback to determine the yea or nay of flexion, extension, and deviation, the yea or nay of when and if the hand squeezes, will we be talking testable hypotheses. Until then all this talk interpreting wrist usage from high speed video analysis is just observation, not science. I include the imagery used to proclaim no wrist usage in Agassi's, and Federer's, forehand. During the forward swing it is indeed noted the wrist flexes forward somewhat from the fully extended position but that the wrist remains still extended prior to, during, and immediately following contact. The top left and center photos show what the wrist looks like immediately following contact, and it also looks just like this prior to and during contact. This is the look from which Braden, et. al., opine the wrist was not moving [flexion] "a single degree...at the impact point." The second photo on the right of Andre shows a second angle of his middle photo. Of note is Federer shows radial deviation. 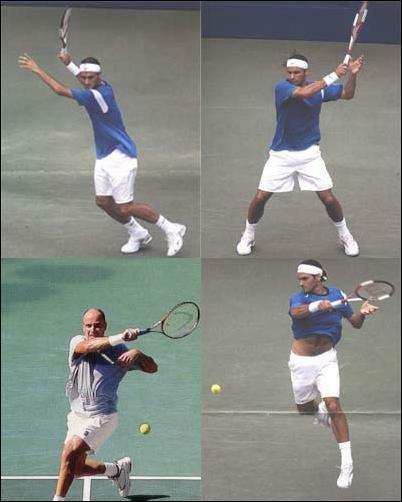 This 4some series shows the concluding look to the wrist after this so-called non-flexing wrist of Agassi and Federer assumed from the photos above. The top left in this group shows the characteristic setup with the wrist fully extended, common to both. The next three photos occur just a fraction of a second later than the series above, with the ball still visible in the frame. Similar to the basketball montage above where what we know to be wrist usage during the shot is seen after the release of the basketball, our wrist usage during the shot is seen after the ball has left the strings: flexion and deviation. And it wouldn't surprise me if we see it within a similar timeframe after contact as we see in basketball after the ball's release. Look, even if I did snap my wrist on a forehand what do you think you're going to see on film at the impact point, the wrist flexing forward? No, because I'm wielding a 27 inch long, 10+ ounce stick with a flat surface on one end in a particular way against a ball moving at X miles per hour against it. I'm adding shots of Sharapova, Roddick, Agassi, and Federer forehands milliseconds after contact that clearly show the player's stroke and strike pattern. 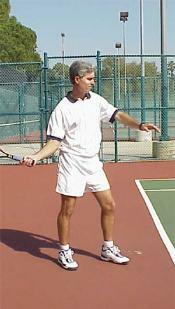 The racket face rollover is not part of a secondary strike pattern, it is primary and the act begins prior to contact. Vic Braden's statement above, "The racket face is vertical at impact as it moves from low to high. High-speed motion pictures also substantiate that the ball leaves the racket face long before the racket face begins its rollover" was based on his singular attempt to document topspin in 1977. In the face of so much photographic data offering more information on the topic, and considering he will not entertain any other interpretation of his own data and that his attempt was not a true experiment since the method was not testable by peers, I would conclude his statements are to be interpreted as belief and not science. I don't know why self-styled scientists, academics, analysts, continue down this road. I ask you, do you believe that professional athletes can't communicate what they are doing, that they don't know what it is they're doing when they do it, that their auto-feedback systems are faulty at heart and can't be trusted? Maybe...? Then consider: professional athletes will try another way in a heartbeat if they find it's a better way, they don't have an ax to grind, or a position to defend. All say they use their wrist, none says they don't. It seems to me those who can't hit a ball like a pro need to swallow their pride and heed the pros' advice and then get in the business of describing how they do it so you can do it too. But denying the use of the wrist in our strokes as deliberate upon the impact point is laughable, and it's also sad because a lack of accurate information directly impacts our recreational players adversely. Ignorance is bliss, they say, but here ignorance spins with aplomb. ¡Ay no! You don't snap the wrist on a groundstroke, far from it. But the wrist is being used, it moves, it flexes, it is not held fixed or locked. There is both flexion and deviation during the forward swing prior to contact. Freedom from ideologues. Freedom from demagoguery. Freedom. I invite you to look at an outstanding slow motion video on YouTube of Roger Federer hitting 8 forehands, 3 backhands, wherein you can clearly see so much of what Revolutionary Tennis offers actually occurs on a forehand groundstroke of superior quality. You clearly see the racket face wobble (equal and opposite reaction at work) and the hand working against it to counter, you clearly see the racket face more than vertical on the ball for contact (there are too many examples here for anyone to argue this happens after contact), you clearly see the hand and wrist "moving" in any direction you want that only one not interested in learning would deny (extension to begin with, then flexion, deviation). You can also deduce that on the two seemingly serve return blocks that Roger's hand and wrist must be doing something to keep the racket face vertical, that is to prevent it from opening up against the forces during contact. I will try to identify the shots involved in the YouTube video, though guessing at best since there's little info to go on and perhaps you will have a better clue. Forehand 1 is a groundie in play, possibly a pass attempt; # 2 and 3 are blocks where he's holding on, probably serve returns; #4 is a wide stretch groundie and Roger really holds on so the racket face does not wobble; #5 is a mid court approach shot; #6 is a miss-hit stretch groundie (when the racket flips over on contact it is often this idea of an off-center miss hit that is offered as the reason for the rollover instead of the player's intent); #7 is a wide groundie; last one is a down the line passing shot. You can argue some of these may not have cleared the net, but it is clear on some the ball is indeed rising after the hit where the racket face is closed for contact. Furthermore, if you look at Roger's second backhand, the first one after the downward slice shot which is followed by a look at his feet, you will be able to see the racket face is slightly open when it is all the way back and when he draws it down and forward into the ball the racket face has turned/is turning (or closing) into the ball at contact. This of course means he's using his wrist, as predicted by Revolutionary Tennis. Establishmentarians would argue forearm supination as the cause of this, but that's like saying your forearm turns the screwdriver to tighten the screw.